Dr. Amaurys Ramirez-Torres has more than 20 years of experience providing preventive, restorative and cosmetic dental care including fillings, extractions, root canal therapy, crowns, bridges, dentures, dental implant restorations, veneers, and teeth whitening. He is fluent in both English and Spanish. He earned his dental degree at the Higher Institute of Medical Science of Santiago de Cuba in 1995 and practiced as dentist in Cuba and Venezuela. He moved to the United States and earned a Doctor of Medicine in Dentistry degree from Rutgers School of Dental Medicine, where he was given the Jody Z. Bardash, DMD Clinical Excellence Award. Dr. Ramirez-Torres loves using his skills to help others and has regularly provided voluntary dental care for community outreach programs. 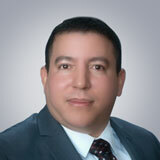 He is a member of the American Dental Association and the Florida Dental Hygiene Association.